You use commands to tell Microsoft Word what to do. In Microsoft Word 2013, you use the Ribbon to issue commands. The Ribbon is located near the top of the window, below the Quick Access toolbar and the Title bar. A Tabs: At the top of the Ribbon are several tabs. Clicking a tab displays several command groups. B Command Groups: A command group is a group of related command buttons. Each tab has several command groups. C Command Buttons: You click command buttons to issue commands or to access menus and dialog boxes. Menus and dialog boxes provide additional options and/or commands. D Dialog Box Launcher: You may find a dialog box launcher in the bottom-right corner of a command group. Click the dialog box launcher to see additional commands in a dialog box or pane. When you select a Ribbon option, Word may present a gallery. A gallery is a set of options. 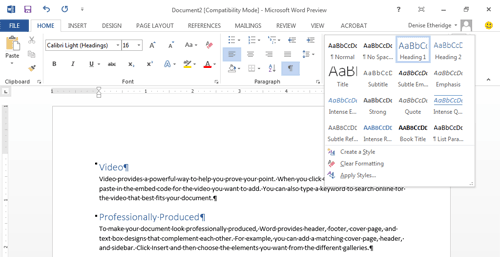 When you hover over an option, Word provides a live preview of how your document will appear if you select that option. For example, if you press the down-arrow in the Styles group, Word presents a gallery of styles. If you hover over a style, any text you have selected appears in that style. If you select the style, Word reformats your selections to that style. As you work, the Ribbon can be either pinned or unpinned. When the Ribbon is pinned, tabs and command groups are visible. If the Ribbon is pinned, you can unpin it. When the Ribbon is unpinned, you can see the tabs but not the command groups—when you click on a tab, the command groups appear. If the Ribbon is unpinned, you can pin it. Choose any tab. The Ribbon appears. Click the pin in the lower-right corner of the Ribbon. Word pins the Ribbon and you can see the command groups. Note: The pin only appears when the Ribbon is unpinned. Click the chevron in the lower-right corner of the Ribbon. Word unpins the Ribbon and you can see the tabs but not the command groups. Note: The chevron only appears when the Ribbon is pinned. Are there other ways to pin and unpin the Ribbon? Yes. Right-click on the Ribbon, then on the menu that appears, click Collapse the Ribbon. If the Ribbon is pinned, clicking this option will unpin it. If the Ribbon is unpinned, clicking this option will pin it. Here is another way. If the Ribbon is unpinned, hold down the Ctrl button and press F1 at the same time to pin the Ribbon—this is usually written as Ctrl+F1; if the Ribbon is pinned, hold down the Ctrl button and press F1 at the same time to unpin it. How can I find out what each button on the Ribbon does? When you hover over a button, Word displays the name of the button, a description of the button's function and if a shortcut key is associated with the function, Word displays the shortcut key. If you do not see a button name and/or a description, the setting that causes the button name and/or description to display is turned off. To turn these features on: 1) Choose the File tab. A menu appears along the left side of the window. 2) Click Options. The Word Options dialog box opens. A menu appears along the left side of the dialog box. 3) Choose General. 4) Under User Interface Options, click the down-arrow next to the ScreenTip Style field. Word presents the following options: Show Feature Descriptions in ScreenTips, Don't Show Feature Descriptions in ScreenTips, and Don't Show ScreenTips. Click the option you want—for a description of each option, see the following ScreenTip Styles table. 5) Click OK to make your change and close the dialog box. If you do not see a shortcut key, either the function does not have a shortcut key or the setting that causes shortcut keys to display is turned off. To turn this feature on: 1) Choose the File tab. A menu appears along the left side of the window. 2) Click Options. The Word Options dialog box opens. A menu appears along the left side of the dialog box. 3) Choose Advanced. 4) In the Display section, check Show Shortcut Key in ScreenTips. 5) Click OK to make your change and close the dialog box. How do I use the Ribbon Display Options Button? The Ribbon Display Options button is located in the upper right corner of the Word window, next to the Help button. This button provides options similar to pinning and unpinning the Ribbon. When you click the Ribbon Display Options button, the following options appear: Auto-hide Ribbon, Show Tabs, and Show Tabs and Commands. If you select Auto-hide Ribbon the Ribbon will disappear. Click the top left side of the window or click the triple dots in the upper-right corner to display the ribbon and the command groups. Click anywhere in the text area to hide the Ribbon. If you select Show Tabs, only the Ribbon tabs will display. Click a tab to display the command groups. This is the same as unpinning the Ribbon. If you select Show Tabs and Commands, both the tabs and the commands will display at all times. This is the same as pinning the Ribbon.